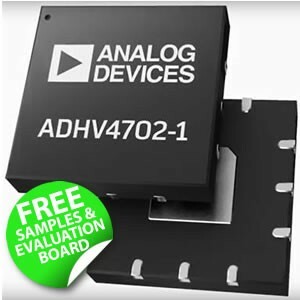 Analog Devices has launched the ADHV4702-1 which is the industry's first high voltage (HV), high performance precision operational amplifier. 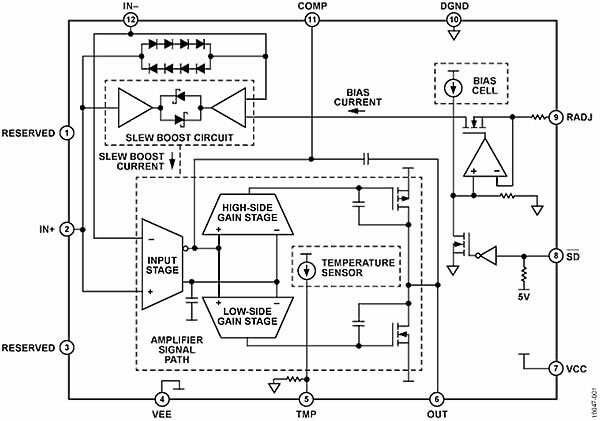 The ADHV4702-1 is a high voltage (220V), unity-gain stable precision operational amplifier. The device offers high input impedance with low input bias current, low input offset voltage, low drift, and low noise for precision demanding applications. The next generation of proprietary semiconductor processes and innovative architecture from Analog Devices, Inc., enable this precision operational amplifier to operate from symmetrical dual supplies of ±110V, asymmetrical dual supplies, or a single supply of 220V. For precision performance, the ADHV4702-1 has a 170 dB typical open-loop gain (AOL) and a 160 dB typical common-mode rejection ratio (CMRR), the ADHV4702-1 also has a 2 μV/°C maximum input offset voltage (VOS) drift and an 8 nV/√Hz input voltage noise. The device is ideally suited for demanding applications like HV current sensing, ATE, DAC output buffers, piezo transducers and LIDAR APD. The ADHV4702-1 is available in a 12-lead, 7 × 7 mm lead frame chip scale package (LFCSP) with an exposed pad (EPAD) compliant to international electrotechnical commission (IEC) 61010-1 creepage and clearance standards. The copper EPAD provides a low thermal resistance path to improve heat dissipation and features high voltage isolation, allowing it to be safely connected to a 0V ground plane regardless of VCC or VEE voltages. The ADHV4702-1 operates over the −40°C to +85°C industrial temperature range. The EVAL-ADHV4702-1CPZ evaluation board helps users evaluate the ADHV4702-1 offered in a 7 × 7 mm, 12-lead lead frame chip scale package (LFCSP) with an exposed pad at the bottom. The evaluation board provides a platform for quick and easy evaluation of the ADHV4702-1. The evaluation board is a 6-layer board designed to minimize leakage currents with its guard ring feature. It accepts Subminiature Version A (SMA) and Subminiature Version B (SMB) edge mounted connectors on the inputs for easy connection to test equipment or other circuitry. For safety please read the User Guide first before using the evaluation board. Anglia are offering customers FREE evaluation board and samples of the ADHV4702-1 High Voltage, Precision Operational Amplifier from Analog Devices, please fill in the form below to register for your FREE samples now.